Our Government and Their Scientists are Living on Fantasy Island. Billions and Billions of dollars of environmental destruction on the North Shore of Kauai, HI. and they have no answers. Major environmental disaster underway in Kauai, Hawaii. Do you guys see the government anywhere? 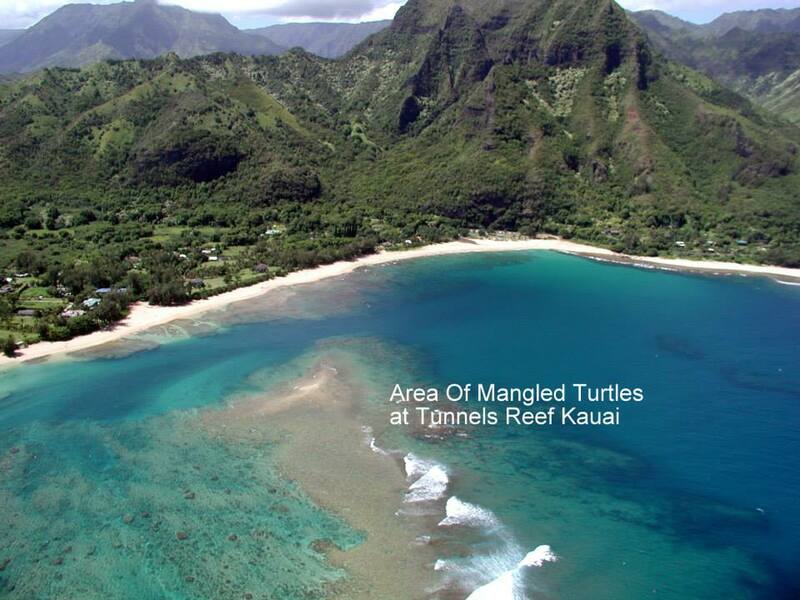 I did a snorkel yesterday at Tunnels and out of 8 turtles I saw, four had damaged shells, chipped shells and or mangled shredded flippers!! This is the same kind of damage I saw during RIMPAC. The turtles looked like they had gone through a firing squad! What else could cause this but the Navy sonar? 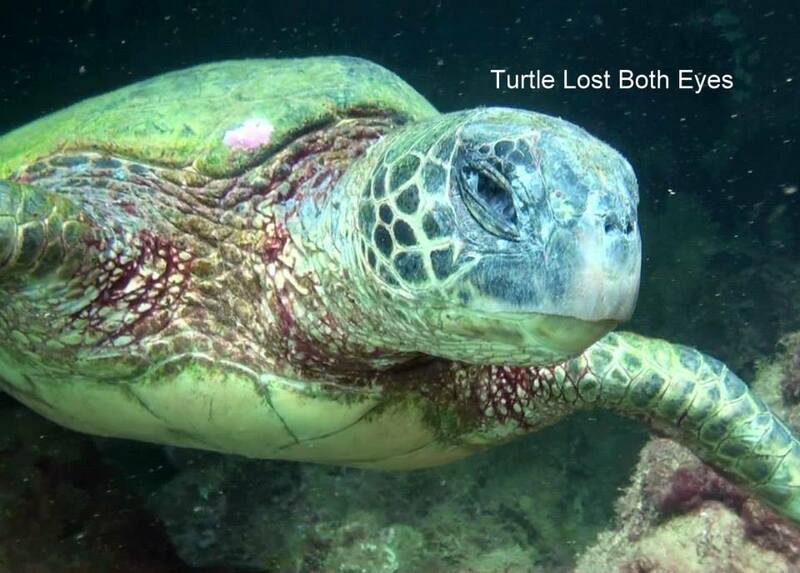 I now have seen over a dozen turtles in this poor shape out at Tunnels and I only dive there twice a month so just think how many are actually damaged or have been killed. 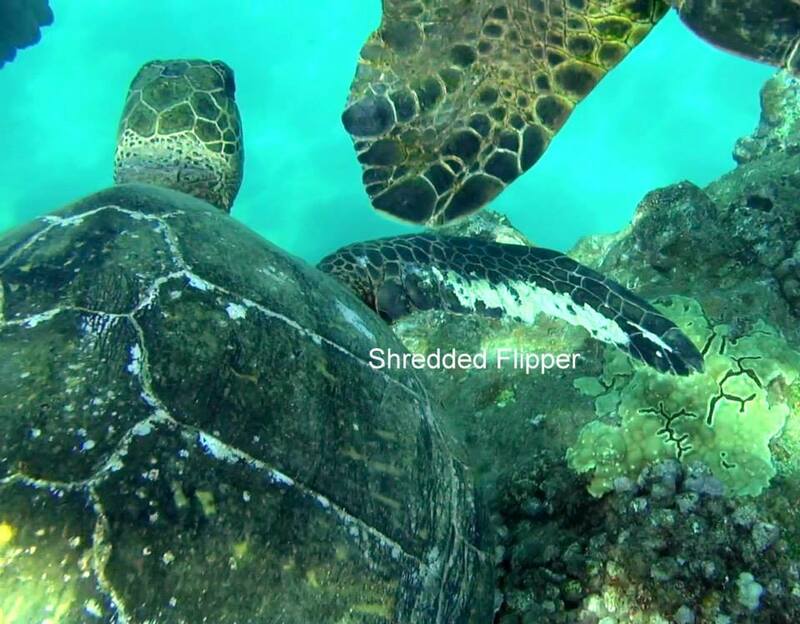 I have not seen any turtles at Tunnlels with tumors like I see often on the south side and these turtles are in clean pure water on the outer reefs with a good flow rate of mid ocean water. Since the turtles are protected under the Endangered Species Act it seems like someone should follow up and try to find out what is killing them. Are front flippers worse than back? 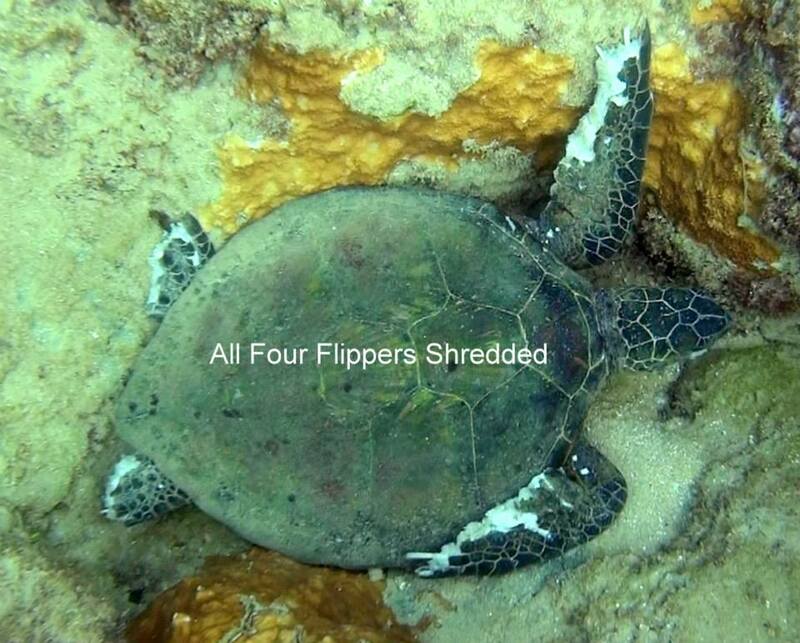 I notice the damage appears along the trailing edges their flippers and along the thin edges of the scutes of the shell. I think the cause is some type of energy that is discharging along the thin/pointed parts. You are 100% correct. No decaying tissue, no black diseased tissue and the worst damage on the inside edge of the front flippers, thin edge of the scutes, and around the eyes!! All discharge points! 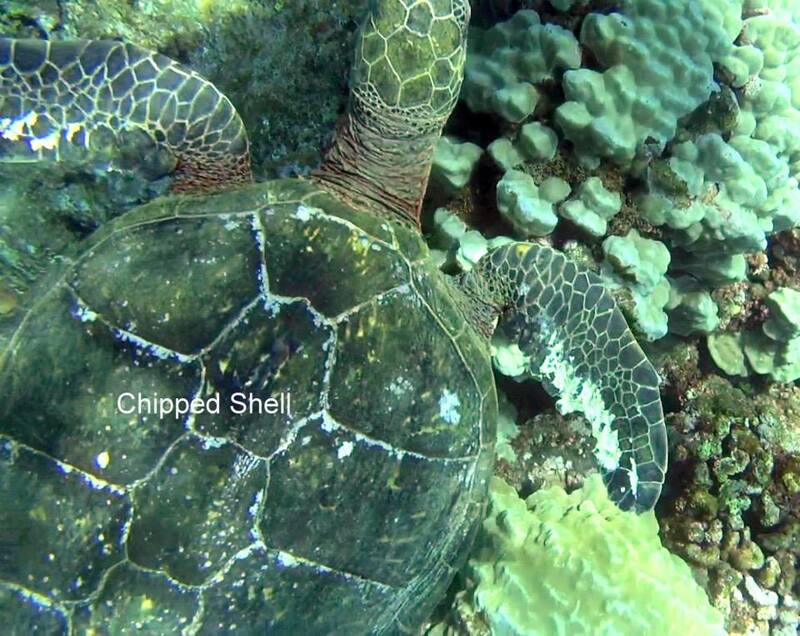 The tissue damage on these turtles is fresh because there is nothing growing on the white tattered inner tissue! I know we are right but who will listen is the question! The news and Dr ………. 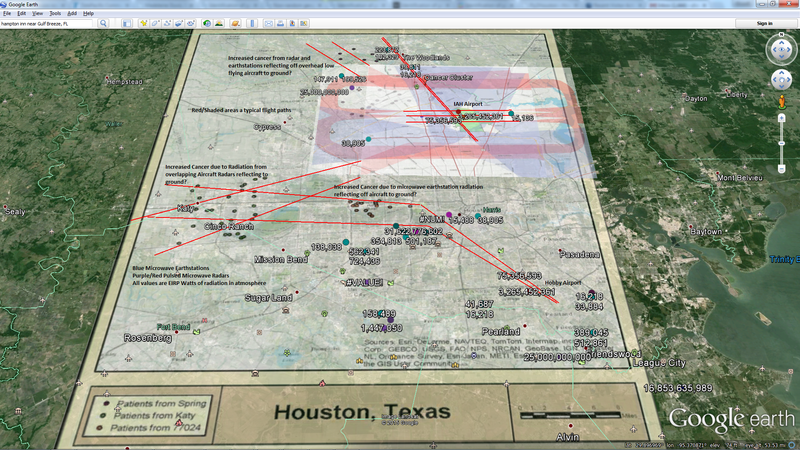 from the USGS Infectious disease department already responded with concern so that is good! Dude, do those turtles look normal to you? I would hope that there are more people out there to help in investigating this. One would think this is a superb news story that a major news network would take on, but it seems those mainstream news networks are more concerned about appeasing our government than doing true investigating reporting. Can they make a human model as well? Please file a petition @whitehouse.gov/petitions and put on fb and other social media. I understand that, but a petition on social media could get more support from the masses. When the 47 republicans wrote their letter to Iran, the petition filed went viral and in 4 days there were 250,000 signatures. This is something , with your photos and story, could get much more attention quickly. Petitions seem to make an impression more than a regular post sometimes. Just trying to help get the word out. If I had a better grasp of the situation I would file it myself. 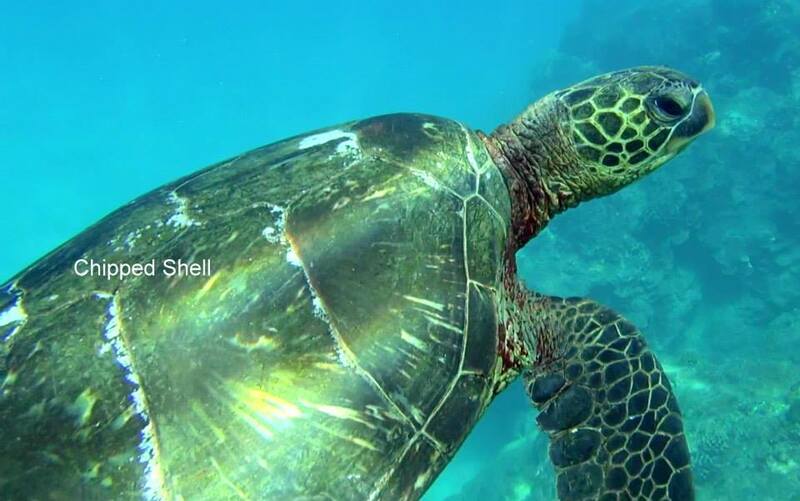 There are many people who have been to Hawaii and have a fondness for these creatures. I’m sure they would be outraged as well. It couldn’t hurt for you to try the idea out. It’s a very simple process to file a petition, relatively speaking. There are many filed all the time, for far less important things than this. At least check into it. Yes, that’s the site. Look at the list of existing petitions for format. The right wording can do so much. Let me know and I will be happy to share and help get the word out. Facts not emotion will do the most traveling on social media. Good luck and thanks for bringing the situation to my attention. Now, if you post your story with the petition embedded in it. The connection to effects on wildlife will be made. I posted your story after the petition. A clear explanatory connection will get attention since most have no idea what the petition is about since most have no idea what is going on. Show them, explain it in layman’s language and add petition within the body of the story. I did post a copy of the petition on my blog and some pictures with a link that takes you to the petition to sign. I have already reposted it twice since that keeps it at the top of posts so people checking in at different times don’t have to dig so far. Now over 219 signatures. If you find a way to include story with the petition attached, it makes it easier for folks to sign. Doing what I can. OK, the petition is on Whitehouse.gov, , WordPress, Facebook and Twitter. Only 99,998 signatures to go. Your turn!